Darius Pliskauskas fired Phantoms ahead at Milton Keynes. Peterborough Phantoms were left to reflect on an unwanted clean sweep after crashing to their fiercest rivals again last night (February 27). The city team were pipped 2-1 in overtime by Milton Keynes in both clubs’ only English Premier League outing of the weekend. Jordan Cownie (left) scored the winner for MK against Phantoms. The latest setback in Buckinghamshire means Phantoms have lost all six games against Lightning during the regular season – although three of those reverses have arrived in sudden-death after picking up a point. That was the case again last night as Darius Pliskauskas made the breakthrough 19 seconds before the buzzer at the end of the first period. It took the hosts until the final session to level through former Phantoms prodigy Lewis Hook and another of the club’s old boys, Jordan Cownie, settled the issue just with almost half of the additional five minutes gone. 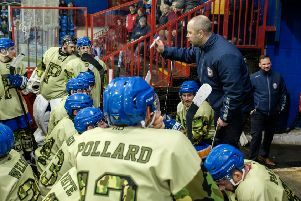 Phantoms coach Slava Koulikov said: “We played a good game on the whole, but we just couldn’t get the second goal that I felt would have meant no way back for MK. “We had the chances, and we had a couple of powerplays, but we couldn’t quite get the bounces to go our way. “There is always a danger of being pegged back when only having a one-goal advantage against a very dangerous team and MK managed to get level before getting the extra point. “I would have loved to beat MK in the league as they are our big rivals. It didn’t happen unfortunately but I can take some positives out of a bad situation. But, following last night’s clash, Koulikov was again left to rue the overtime rules which appear to regularly leave his team at a disadvantage. Teams are only permitted to ice one import at any given time during the three-on-three session – a role taken by netminder Janis Auzins for Phantoms. The problem was exacerbated in this game as Marc Levers picked up a tripping penalty 17 seconds from the end of regulation time. While his actions halted a dangerous Lightning attack, they also meant the hosts had an extra man, who could be an import, for the opening part of overtime. And while Phantoms did manage to negotiate that spell, they couldn’t prevent Milton Keynes man Cownie from striking on a delayed penalty. Koulikov’s side have only been successful in three of their 10 fixtures to have gone to overtime this season. He added: “We have lost a lot of points in overtime and the rules have really hurt us. Phantoms were again without import Ales Padelek last night. The Czech forward was released from hospital during the week following treatment for an infected elbow injury and continues to take a course of antibiotics. Koulikov will make a late decision as to whether Padelek is fit enough to feature in the EPL Cup final clashes against Guildford in midweek. Phantoms travel to Surrey for the opening leg on Wednesday (March 2) before hosting the return clash at Planet Ice the following night. Guildford leapfrogged Phantoms into second spot in the league standings last night. The city men drop to third.